This song makes use of some serious techniques – even the well seasoned shredder will have his work cut out. Practise it in small lumps and build the speed up gradually. The riff is fairly straightforward and is a great example of writing with the harmonic minor scale. It’s time for another Masterclass, so have your cordless drills at the ready – here’s Pablo Gilberto! Some time ago we published Albert Lee masterclass, song Why Not? Paul Gilbert needs no introduction. From Shrapnel shredders Racer X to chart topping rock supergroup Mr Big, Paul always displays awesome technique and a great sense of humour. These days, Paul is embarking on a solo career writing power pop songs with a definite Cheap Trick vibe. The idea of this two-part lesson is to look at the different facets of Paul’s playing. We see Paul in full neo-classical shred mode. Exercise 1 is Paul’s solo found on Pablo Wablo and contains many classic Gilbertisms, including fast alternate picking, legato and string skipping. The phrasing of this section is very important, so look out for the cut off symbols and Paul’s wide vibrato technique. Bars 7-8 conclude this section with some fluid legato runs, plus a wrenching bend with some aggressive vibrato. Bars 9-12 introduce an excellent syncopated bending lick. Once again, look out for Paul’s awesome phrasing, as this is vital in creating the right feel and tension. Bars 13-16 conclude the first verse with more bends and fast picked/legato patterns. Watch the pitching of the semi-tone bends, plus that ever-present wide vibrato. Pay close attention to the large bends and take care with the position shifts. Bars 21-22 lead back to a more straight-ahead rock sound, with more A minor pentatonic patterns. Bars 25-26 reintroduce the verse, with more fast picking lines using E Phrygian dominant. Paul also includes some legato patterns and position shifts, adding tension over the backing riff by applying a wide-stretched, string-skipped G# diminished arpeggio. Bar 27-28 include the G# diminished arpeggio with some additional tapped notes a minor third apart. Paul was really going for it at this point, so to make this lick easier to remember I have arranged it as a set pattern. Bars 29-32 include more fast picked/legato position-shifting runs, concluding with one of Paul’s fast picking patterns. Take care with the position shifts and practise it very slowly to start with. Remember: Paul is one of the best pluckers around. Bars 33-36 include more neo-classical phrases that incorporate fast left-hand legato and position shifts. Look out for the rhythmic bends at the end of bar 36. Bars 37-40 must be one of the most terrifying licks ever and, believe me, this was a straight take. Paul required no drop-in. The only thing dropping were mine and Phil’s jaws. This section includes fast thirty-second-note lines that use very wide string skips, from the top E to the remaining five strings. Once again, practise this very slowly. The wide jumps can cause noise problems if you hit the open strings you are skipping. Paul demonstrates this lick on his Terrifying Guitar Trip video. And F Lydian against the F chord. Bars 45-46 include more fast A Aeolian licks that contain wide stretching, position shifts and even some string skipping. More slowed-down practice is definitely required here. Bar 47-48 conclude the chorus with some slippery legato phrasing and yet more slippery position shifting. Bars 49-50 introduces the final verse with yet more fast neo-classical runs. Bars 51-54 include more stylised licks with fast legato phrasing. Look out for the ascending triplets in bar 52 and make sure that you cut the notes off. Bars 55-57 conclude Pablo Wablo and feature more scary licks. The fast tapped lick in bar 56 will take a lot of practice. Look out for the notes that are repeated by both the left and right hands. Once again, this lick is so fast that I have arranged it into a pattern. Get the notes under your fingers and go for it. Exercise 2 is the riff played by Phil Hilborne on Pablo Wablo. It’s based around the E Phrygian dominant scale. The riff also includes some diminished arpeggios. During the verse, Phil performs some shifting octave patterns against the open E string. The riff concludes with the F and E5 chords at bar 12. These two chords are replaced by F and E major at bar 16. The chorus is introduced at bar 17 and includes the chords of A5, F5 and F(#4). The riff concludes at bar 55-57, with an ascending and descending diminished arpeggio figure, and a second guitar performing a harmony a minor third apart. 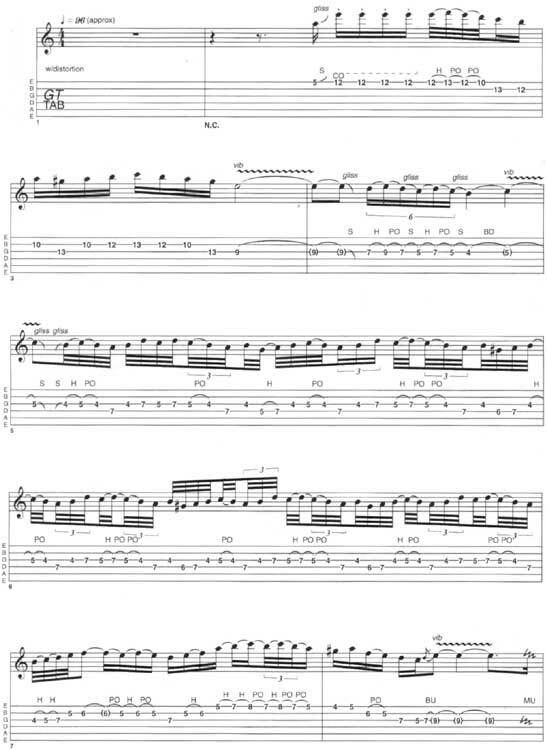 It’s a part of Paul Gilbert lesson Pablo Wablo guitar tab and sheet. © 2012 - 2019 TabsClub Powered by TabsClub 42 queries in 0.358 seconds.